Both lights are controlled by a button on the headlight, which is easy to grab and push while riding, even with gloved hands. 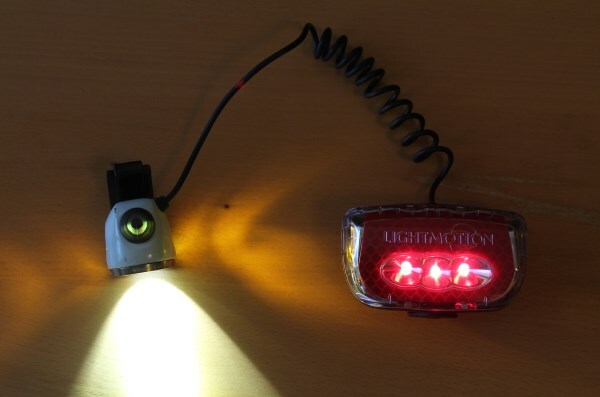 Three modes are available for the headlight: high, low, and flashing. The taillight always has a slow pulsing pattern, regardless of the headlight setting. The taillight's output is reduced when the headlight is in the low setting, and is high when the headlight is on high or flashing. A small button on the battery pack/taillight turns off the taillight when pressed, which allows the front light to be used like a headlamp. Unfortunately, I found the tiny button very difficult to activate – it must be pressed with just the right amount of pressure in just the right way, and is impossible to use with gloves. A more tactile button would be a welcome change, as it would allow for using the light like a headlamp when locking up or packing your bike at night, and then quickly turning on the light when it's time to hit the road. Because it's specifically designed for helmet use, the mounting system is much more elegant than straps typically used to attach regular-use headlights to helmets. The light has a low profile, reducing risk of catching it on branches. 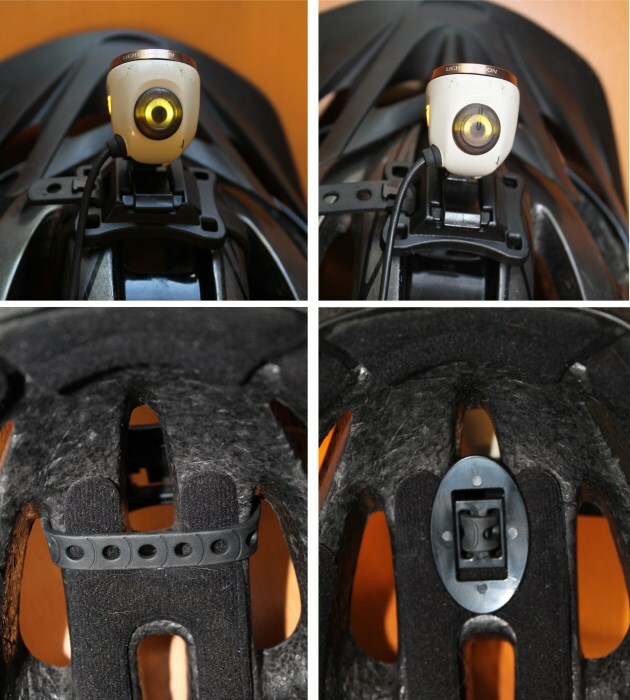 The headlight slides into a mounting plate which can be attached to the helmet using a provided rubber strap in two different ways. The strap can simply slide into two vent slots in the helmet, securing the plate between them. Alternatively, the strap can be threaded through a small plastic plate, which goes on the inside of the helmet, holding the mounting plate in place through a single helmet vent. I initially tried the latter configuration, but found that the light was prone to rotating and sliding around, so I changed to the two-vent mounting system. The taillight mounts with a square bracket that the light snaps into with four tabs. The bracket attaches to the back of the helmet with the provided velcro straps. It was somewhat difficult to mount on my helmet, which has a pointy back, but after adjusting for a while I was able to get it reasonably well secured. The light pops out of the bracket with relatively little force, which I believe is a safety feature: if the connecting cable were to get snagged, the back light would pop out to relieve the force. Despite having both a front and rear light, the package weighs only 130 g; less than many one-piece helmet-mountable headlights. Riding around with it for several weeks, the extra weight wasn't even noticeable, and it had no impact on the comfort of my helmet. 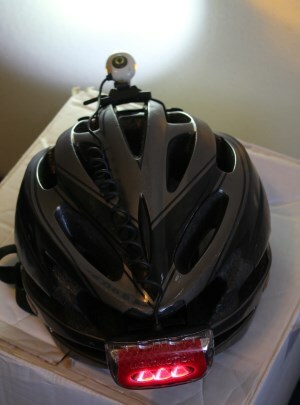 The Vis 360 lasted over 3 hours on the highest setting with both the headlight and taillight turned on. In the flashing mode it should last significantly longer – L&M claims 16 hours. A small LED on the taillight/battery package indicates remaining charge as it changes from green to yellow to red. It appears as if there is a green LED on the headlight, but it doesn't seem to change color as the battery drains. I actually thought the battery was still nearly full because the of the green light on the headlamp, and was confused when the light turned itself off. That's when I noticed the much less conspicuous indicator on the back, and realized the "green light" on the front was really the headlight itself shining through the green-tinted button membrane. A darker button would help avoid this confusion. The Vis 360 is very successful at what it sets out to do: provide visibility and safety from every angle. I don't think it's a viable standalone replacement for standard handlebar and seatpost/rack mounted lights. 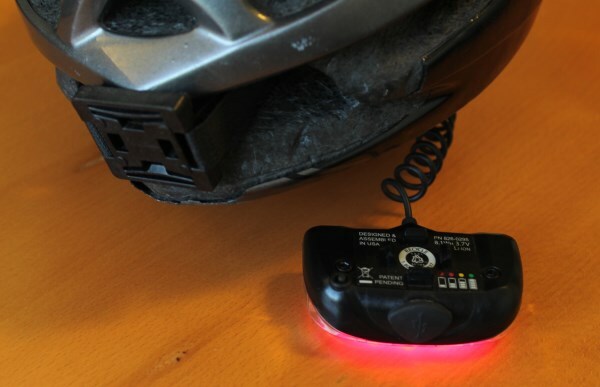 Helmet lights are great because wherever you look, the light's looking there too, but this means that when you move your head, suddenly you no loner have your forward facing white and rear facing red lights. This can make it harder for others on the road to visually track your speed and position. Although the Vis 360's side visibility lights prevent you from losing all visibility when turning your head, that steady white or red light still disappears. Additionally, while the front light is bright enough to light your way in a pinch, the beam isn't nearly as smooth as L&M's other headlights. I've also experienced issues using a helmet-mounted light in thick fog, mist, or rain: the light reflects off the water particles directly into your eyes, a problem I haven't had with handlebar mounted lights. As a secondary safety light though, the Vis 360 is unsurpassed. 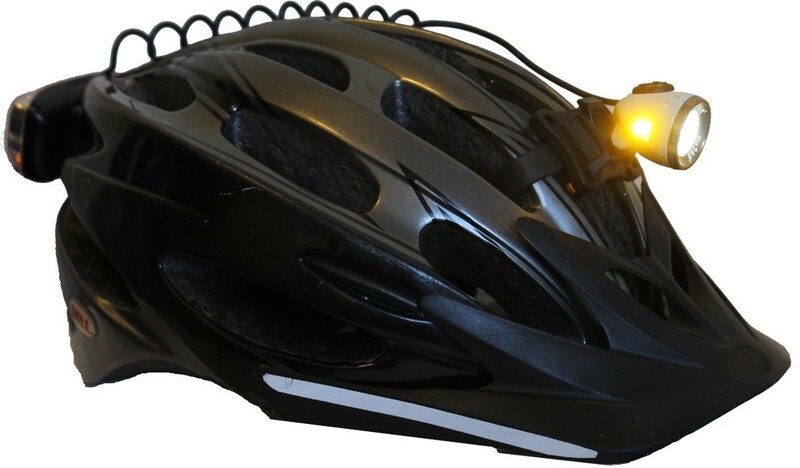 No other light is designed for such convenient helmet use; in fact, I've yet to see any helmet-mounted taillight that is bright and rechargeable. Though somewhat pricey at $180, it's a worthy investment for people who spend a lot of time biking in traffic and want to stand out. If you want helmet-mounted lights, I think it's worth the cost simply to avoid the hassle of attempting to jerry-rig lights that aren't designed for helmet use, and for the taillight optics that are actually visible from every direction. The Vis 360 (not +) is also available for $100 with 120 lumens of output, and would be a good alternative for those seeking to add some visibility at a lower cost. L&M has also recently released the Vis 360 Run, which is nearly identical to the Vis 360 but with a headband strap instead of bike mounts. 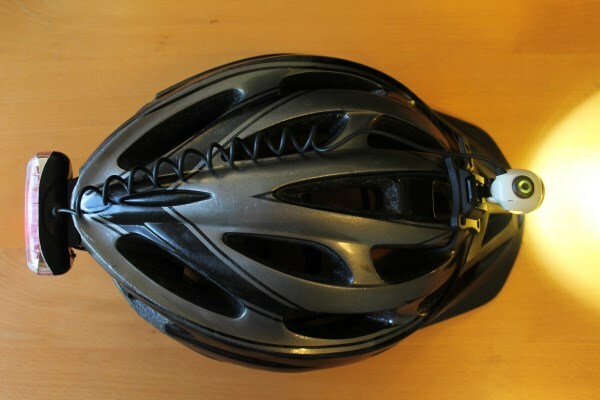 It's designed for use by runners, hikers, and other activities without a helmet. The headband strap can also be purchased separately for $20, and is compatible with the Vis 360+.